Problem: no matter how carefully I put them away, my iPod's earphone cords get tangled while not in use. Always in a hurry during a workout, disentangling consumes precious moments when I should be sweating (out of exertion, not frustration). Solution: I was pleased, then, to find the Earbud YoYo, an easy-to-use gizmo that keeps the cords threaded around a spool. It's about an inch square, and it comes in 8 colors and 8 patterns. I chose Leopard -- grrrrrrr. The first day I used it at the gym, two people asked me about it. Earbud Yo-Yo was unveiled last month at the Consumer Electronic Show in Las Vegas and was invented by idea-maven Julie Johnson Barkley. I'm afraid I didn't pay enough attention to the product when I ordered it -- I was expecting it to have a retracting effect, where the cords would unwind easily when I use them and rewind when I'm done with them (like an old Electro.Lux vacuum). Instead, I must manually wind and unwind. That said, I use and like my Earbud Yo-Yo, and it offers a BIG improvement over the tangle. You can get your own favorite color/design for $16 at Covington Creations. Makes a good gift for yourself or for the music-lover in your life. Covington Creations is offering a free Earbud Yo-Yo to THREE All Thumbs readers. Simply leave a comment for one chance. Entries received by 3 pm (MST) on March 1 will be considered. 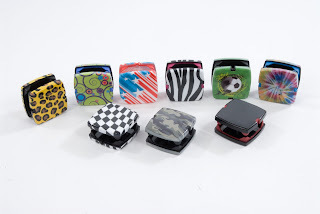 We'll use random.org to select three winners who will receive their Earbud Yo-Yos directly from Covington Creations. A big triple thanks to Covington Creations. Update: random.org chose 15, 9 and 2. Trying to track down your mailing addresses -- please email them to me ASAP and Covington Creations will mail your EarBud Yo-Yos out right away. Congratulations. And thanks to everyone for playing. What a cool product. Love the idea! What a great way to speed up my workout. I spend at least 5 minutes gettig my earbuds ready. Put it on my facebook. I guess I need to know...do you want to be my friend? SO you can see the link. Ooh! I need that! Years ago, I had SONY earbuds for a walkman, that came with a gizmo like that, and it was great! Ooo . . . me too please! I will mention it on my FB page! Nifty product! How come I never think of these things? Hey I just posted this on my blog. I wish I had thought of this. It looks too cool. What a sweet, simple solution to a really frustrating problem. I'd love to be included! I really could use this it would be great to win this.Hope I win. These look great, it seems like every time I set down my earbuds they get tangled! What a great idea! I love this! Why can't I come up with this stuff?! I blogged about this product! Check it out at http://beckyworkman.blogspot.com/. What a great idea! I would love to try these. Thanks! Cool! My son would love this! super fantastic! i get mine in a tangle in my purse. That would be really neat to have since I always have trouble with a tangled mess. What a great idea. I love the Tie Dye pattern. Please enter me. They look like a great product and would love to try them out. Wow, how clever of you to come up with this idea. Please enter me to win one. I look like an air traffic controller with the monster headphones I have now...I'd love these instead. This is such a great idea. I would love to win one! That is brillant, love it! That looks fantastic! I'll like to try it..
WOW. I love the earbud yoyo! It'll be great for my ipod... My ipod always ends up being terribly entangled as i don't have anything to place the wires in so i pretty much just dump it into my bag. Covington Creations rocks! This would be the MUST-HAVE gadget for all music lovers! Thanks Covington Creations! Count me in! Lovely product that would be so useful for my sister. How smart - I would love to have these.